This is a guest article by forensic imaging consultant Mike Mayda. Bio below. Why Use Photogrammetry in Forensics? Photogrammetry can be a very powerful tool in forensic analysis. It is often useful to have an accurate 3D reconstruction of an accident or crime scene, especially in cases where position, distance and perspective are important. Given the large number of photos taken at these scenes, photogrammetry can be a practical way for investigators, lawyers, and insurance adjusters to obtain better information. In addition, photogrammetry can be used to preserve or recover measurement data long after the on-scene investigation has concluded. This is valuable as it can often be months before an investigator re-examines a scene and discovers a new piece of important evidence that he does not have measurements for. Does Photogrammetry Have a History of Reliable Use? Modern photogrammetric techniques have a long history of reliable use, dating back to military applications in World War II. However, the technology was not accessible for civilian use until the advent of the personal computing revolution in the 90s, which made the required processing power available to the general population. Since then, photogrammetry has been successfully used in a wide variety of contexts, ranging from archaeology and geology, to architecture and engineering. The forensic field has enthusiastically embraced photogrammetry. I was an early adopter of PhotoModeler in the late 90s, when the technology was not very well known and it could be quite hard to get courts to accept it as evidence. However, as photogrammetry has become more widely used, this has changed. In the past 15 years, I have not encountered any difficulties with court acceptance of photogrammetric techniques – provided they are used appropriately. PhotoModeler is still my software of choice, as unlike many other solutions, it has a well-established case history in forensics. While forensic photogrammetry has many benefits, it is important to note that not all images can be used for photogrammetric reconstruction. Many accident and crime scene photographers are unknowingly wasting the opportunity to capture good geometric data, when a few small adjustments to their process could result in “photogrammetry-ready” images. Consistency: The photos are taken with the same camera, zoom and lighting settings. Angles: Photos of the scene have been taken from various angles. Reference: There are objects in the photos whose measurements have been taken as a reference. Distinguishable features: The important objects on the scene, as well as their physical features, should be easily distinguishable on your photos (at least 2 or 3 photos showing each feature). Size: The important objects are large enough relative to the size of the entire photo. If you follow these best practices, your photos should be of sufficient quality for photogrammetric purposes. However, do note that the specific requirements of each scene can vary. When in doubt, it is always best to consult with a photogrammetry expert, to see if your photos can be used for an accurate reconstruction. The best way to illustrate the power of forensic photogrammetry is to step through a real-life example. This is an actual case that I worked on recently. I chose this case because the photos used were in fact of very poor quality, which makes this an excellent demonstration of how practical photogrammetry can be – even in less-than-ideal conditions. The case was a trip-and-fall that occurred in a playground. There was a large playhouse in the playground with steps leading up to the main structure. A lady had walked up the steps to speak to her child, who was in the playhouse. As she was coming back down, there was a misstep, causing her to fall and fracture her ankle. 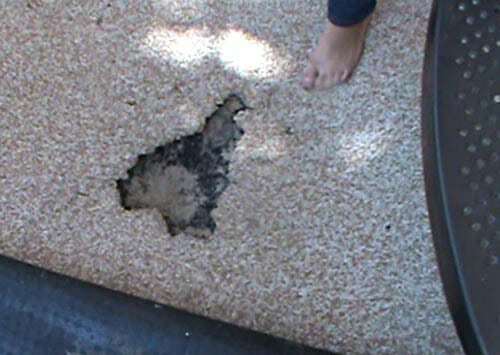 According to the plaintiff, this fall had happened due to a worn hole on the mat near the playhouse steps. 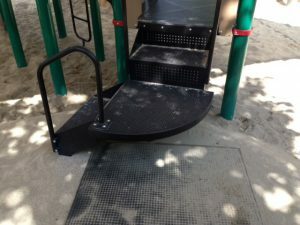 The last step was higher than the previous steps and led down to a rubberized mat placed on top of hard-packed sand. She claimed that she had stepped off the last step onto the irregularity, which caught her foot and caused her to trip. Defense, on the other hand, argued that the irregularity had been located too far away from the steps, and plaintiff could not have stepped onto it. Instead, it was likely that the plaintiff had fallen due to misjudging the height of the last step, and had lost her balance on the high-heeled sandals she was wearing at the time. In this case, it was not possible to determine the distance between the irregularity and the steps through a simple measurement, as the mat had been repaired since the accident. What we did have was 3 photographs of the scene, taken with a low-resolution cellphone camera. Clearly, these were not perfect images, and would not meet the CARDS criteria. However, forensic situations are often less-than-ideal, and the true test of an analytical technique is whether it can stand up under practical, real-world conditions. In this instance, photogrammetric analysis was feasible due to the relatively simple scenario. Essentially, there was only one key variable: the distance between the defect and the steps. Using PhotoModeler, we could generate a 3D model of the scene at the time of the accident. The analysis seemed to suggest that the defect was indeed far enough away from the steps that it was unlikely to have been the cause of the plaintiff’s fall. Our results played an important role in the final settlement. As this case illustrates, photogrammetry can be a very valuable part of the forensic toolkit. For an investigator or reconstructionist, it can provide better information about an accident or crime scene. For a lawyer, the presentation of a concrete visual reconstruction can have a powerful effect on a jury. When applied correctly, photogrammetric analysis can make the critical difference that solves a criminal investigation or wins an important case. Michael Mayda is a forensic imaging consultant. Michael is an expert witness specializing in photogrammetry and visibility analysis. He has been in business since 1977, and currently lives in Sacramento, California.